Many believe that nurse educator programs are so important to the future of the nursing industry, and with good reason. The United States, after all, has long been plagued by a shortage of nurse educators, and that means less qualified individuals to train the would-be nurses of the coming years. But why is this the case? It’s quite simple – the pay difference between the average Nurse Educator and most other Advance Practice Nursing Professionals is quite staggering. If you consider that, being a Nurse Educator is no way to fatten your paycheck. It is, however, a great opportunity for you if you are the type of person who takes pleasure in teaching others and nurturing those who want to follow in your footsteps. Even then, the average annual pay of Nurse Educators isn’t all too bad in a broader sense – the latest Bureau of Labor Statistics figures show that figure as being about $65,000 per year. And by being a Nurse Educator, you are, in a sense, “taking one for the team”, working for less but potentially helping the nursing industry in a much more relevant way. So what does a Nurse Educator do in their profession? Simply put, Nurse Educators are in charge of training and teaching new nurses, and doing so in a variety of settings, e.g. classroom lessons, lab work, hands-on application at hospitals, etc. They also teach college freshmen in entry-level courses, as well as individuals currently employed as nurses but seeking higher education, and existing nurses who want to broaden their palette of skills. A capable Nurse Educator would need to be versatile in their craft, and have several years of experience in different core competencies, such as assessment and documentation. 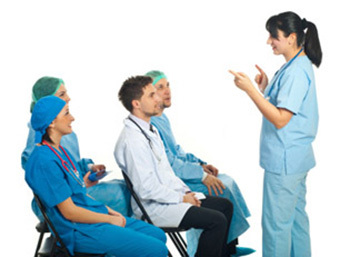 Whether in the classroom or in the clinic, nursing instructors should be conversant when it comes to procedures and interventions, and how to impart such knowledge to their students. Being a skilled clinician as an instructor is just part of what it takes to be a good Nurse Educator. You should also have the skills and patience to impart the above mentioned knowledge and relate your previous experience to those who do not have it yet. It is important that you keep abreast of what’s new in the nursing field, and be updated on all relevant advances. There is also a possibility you will have to go back to school yourself, in order to earn a Doctoral degree. There are also additional curriculum components in programs that include a Nursing Educator Specialty track that would be helpful to prospective Nursing Educators. Typically, students taking up an MSN in Nursing need to complete 40 to 60 credit hours, and 200 to 400 clinical contact hours depending on the program.